There is a range of gear to accompany your surf ski - essential safety items, pads for providing more slip and body rotation and traction for the feet, plus accessories for transporting and storing your ski. We use and recommend the Epic Kayaks and Mocke range of surf ski accessories. Surf Skiing Adventures - Safely! As your skills increase your surf ski really comes into its own - time to get out and enjoy long downwind surf runs on the Bay wave or ocean! In a big downwind run it is important to think about your safety and carry more than just the minimum required safety gear - you need to be self sufficient in safety gear in case your mates cannot get back to you if you get into trouble. Surf ski paddlers, whether training or competing, value a Personal Floatation Device (PFD) that is slim-line, with no protruding pockets to impede their paddle stroke. The Mocke Racer PFD is buoyant, brightly coloured and has flush utility pockets that will hold a drink bladder at the back and some snacks at the front. A Leg Leash (calf leash) is essential safety gear for staying connected to your surf ski or sit-on top kayak. Coil leash attaches just below knee. The Deluxe Leg Leash is equipped with a quick release carabiner. This is a valuable feature for paddlers going in and out of big surf, as you typically do not want to be attached to your boat in larger shore break conditions. The Paddle Leash attaches to your paddle shaft allowing you to keep track of your paddle in case you lose grip or require both hands to remount. Perfect for staying connected to your boat and/or hanging onto your paddle! 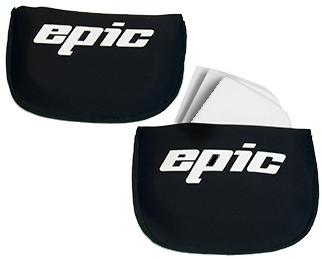 Epic's removable seat pad is made from 6.5mm (1/4") thick closed cell foam and has a slick top surface. This allows for proper rotation in the boat, while adding comfort. Another seat pad is the closed cell foam Mocke Seat Pad - adjustable size by simply trimming it up. This seat pad has a less slick surface. Use these seat pads for comfort or stack them to speed the transition to a narrower boat. The Epic Stability Seat Pad Set uses hook and loop fasteners so you can use 1 pad for everyday comfort, then add another 1, 2, or 3 pads to raise your centre of gravity and help simulate a less stable boat. You can also use them on flat water and then remove them when you get into rougher conditions. The top pad has a slick surface to allow for proper rotation. Set includes 4 pads. The Epic non-slip pads provide traction and comfort on all Epic Kayaks Surf Ski footboards. They fix to the footboards by self-adhesive backing. The Epic hip pads attach to the side of the seat for a more snug fit. Make sure you are safe when transporting your ski and do not overload your vehicle. Check with your local transport authority regarding "projecting loads". Loads should not extend more than 1.2m beyond the front of your vehicle and if protruding more than 1.2m past the rear of the vehicle (or if the driver behind is unable to see the load clearly) you should mark the end of the load with a red, red-yellow or yellow flag. Reflectors or a red light should be used at night. Exact requirements vary from state to state - consult your local transport authority (eg. VicRoads) website. If your surf ski spends a lot of time travelling on your car a travel sock (stretchie cover) is a good investment to protect from excessive UV. Always carry your surf ski in cradles. Ideally your surf ski should be stored inside! If it has to live outside it could be degrading due to UV exposure. A storage cover is a good idea - these are custom made from heavy duty polyweave. Measure up your surf ski for the best fit (circumference of widest part). A set of Boat Stands are useful for resting your ski on whilst performing maintenance, cleaning or for storage. Sometimes parts wear out of are lost. It is possible to get spares of most Epic surf ski parts - bung plugs and rudder caps are easily replaceable. Take care with your ski's rudder - running into obstacles - rocks or snags may drive the rudder up into the underside of the stern of your ski - an expensive mistake. The rotomoulded PE Epic V5 and V7 surf skis can be fitted with a kick-up rudder. Rudders can be replaced (Universal or Surf rudder) but impacts are best avoided!